Giuseppe Giusti Riccardo Balsamic Vinegar, Modena, Italy - Rich & thick...an extraordinarily dense balsamic vinegar with predominant sweet notes, maintaining the famous bouquet of aromas. Riccardo balsamic vinegar is a 2008 Sofi Gold Medal Winner, a vinegar of exceptional quality made according to the original recipe of Riccardo Giusti. Distinguished by its roundness & sweetness, Riccardo balsamic can be added directly to most foods as a thick sauce...ideal for barbecued meats, & cooked meats including poultry, seafood, & game. Drizzle over cheeses, fresh fruit, pancakes, or crepes. 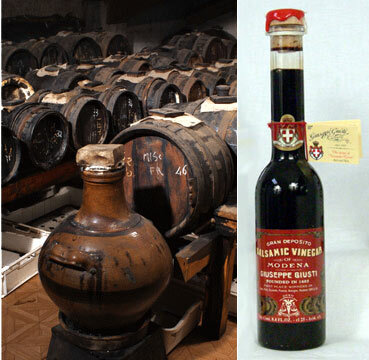 Giuseppe Giusti Riccardo Balsamic Vinegar. Size 250 ml. (8.5 oz. ).